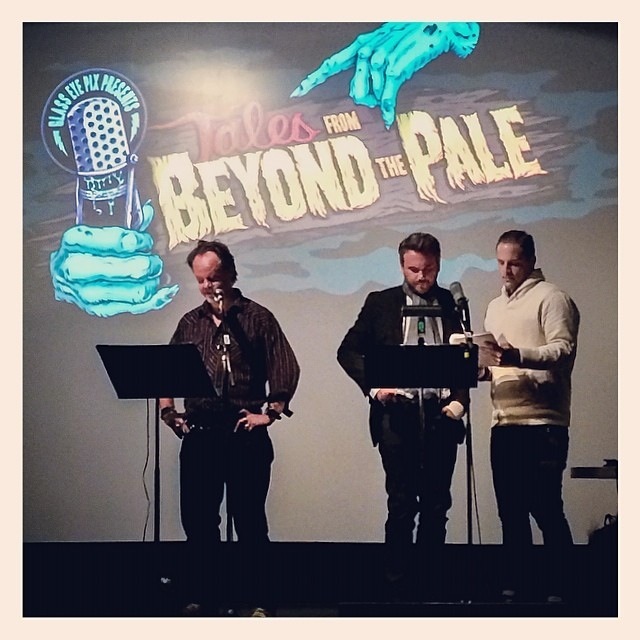 “…Proving horror not just versatile, but essential to our existence were two of the hottest tickets of the weekend: Jennifer Kent’s THE BABADOOK and the wondrous presentation of TALES FROM BEYOND THE PALE LIVE: The Stanley Edition, both of which engage the necessity of art’s dark thoughts and themes. The latter truly proved the treat of The Stanley [Full Disclosure: I was lucky enough to be part of the cast]. Directed by Glenn McQuaid and written by McQuaid, Clay McLeod Chapman and independent horror legend Larry Fessenden, the Glass Eye Pix brand of old-fashioned radio drama rendered live on stage is an incredible occasion as actors, composer, sound designer and foley artist collaborate before an audience’s very eyes offering (again) layers of reverent entertainment. You may close your lids for something of an authentic experience, or open and be wowed by the quick-witted work of telling a tale beyond the pale.